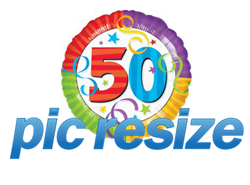 PicResize.com reaches the 50 million pictures resized milestone. PicResize is the internet’s best picture resizing tool. It has been helping people to resize, edit and crop their images since 2005. This free service processes more than 30,000 photographs daily. To find out what PicResize can do for you, visit http://www.PicResize.com. For business development and partnerships, please email business (at) picresize (dot) com.